Students clock up thousands of miles and hundreds of pounds for charity! Determined students have clocked up thousands of miles and hundreds of pounds for charity by completing their own National Three Peaks Indoor Challenge. Public Services students at Nelson and Colne College put themselves through their paces by travelling an incredible 943 miles on a treadmill and bike and climbing 3,408 metres using steps in NCC’s gym in less than 12 hours. 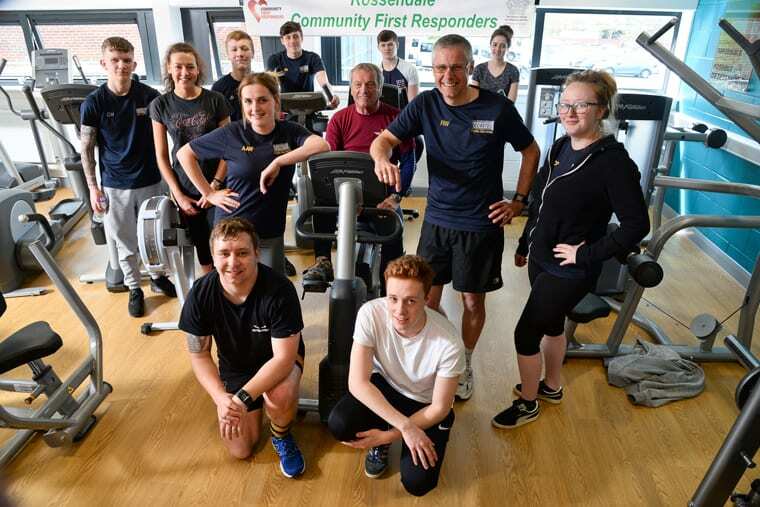 The task, which students organised and run as part of their course, raised around £500 for Rossendale Community First Responders and saw former leader of community first responders and retired Territorial Army Lt Col Brian Pickup MBE pay a visit and take part in activities for an hour. Level 3 Public Services student Amelea Walls, 18, from Nelson, said: “We chose this challenge as we have spoken about doing the Three Peaks for a couple of years, and we chose the charity as our tutor Richie is a community first responder. He has inspired me with his volunteer work, and it is definitely something I would like to now do. In previous years, Public Services’ charity challenges have included a Shoot and Scoot event, where participants ran an organised track and completed an archery task, and a Tour De France inspired fundraiser – where students completed a total of 3910 laps of the Steven Burke Cycle Hub, the equivalent distance to the Tour de France, in aid of charity Army of Angels. Public Services tutor Richie Watts said: “As always, we are extremely proud of the way our students have thrown their heart and soul into organising and taking part into this fund-raising event. They have shown a real dedication and commitment to this physically demanding task, which will stand them in great stead as they embark on their chosen career path. By completing a Public Services course students are able to pursue exciting and fulfilling career paths – including becoming an armed forces personnel, police officer, paramedic, firefighter, outdoor activity specialist and more! For more information about Public Services at Nelson and Colne College visit www.nelson.ac.uk or contact 01282 440272.